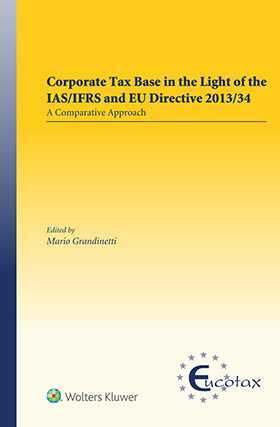 Corporate Tax Base in the Light of the IAS / IFRS and EU Directive 2013/34: A Comparative Approach aims to address how companies’ tax bases will be determined under national law. The recent relaunch of the European Commission’s Common Consolidated Corporate Tax Base (CCCTB) project promises a sorely needed leap forward in the harmonization of the rules by which companies calculate their taxable profits – in particular, the initiative hopes to remedy the severe barrier to cross-border business caused by the ‘accounting Tower of Babel’ by which companies’ tax bases are determined under national law. This thorough analysis and commentary covers the influence of accounting rules on tax, considering both generally accepted standards – international accounting standards (IAS) and international financial reporting standards (IFRS) – and EU Directive 2013/34. Three introductory chapters usher in detailed comparative overviews of the effect of these rules on taxation in nine EU Member States as well as in two other major EU trading partners, the United States and Brazil. This book offers a comparative study of how accounting rules affect tax law in eleven major jurisdictions and provides an in-depth comparison of accounting and taxation from legislative, regulatory, and commercial perspectives. Different models of tax base determination are discussed and compared. The book is a peerless explication of the taxation choices granted to Member States under IAS/IFRS and EU Directive 2013/34 and how they will be affected by ongoing Commission initiatives. Since relevant, timely, reliable, and comparable information assumes a leading role in protecting the interests of investors, creditors, and other stakeholders, as well as in ensuring that all operators act on a level playing field under equal conditions, the analysis presented is of immeasurable value to lawyers, business persons, and officials concerned with taxation, in Europe and other states where international trade is being practiced.